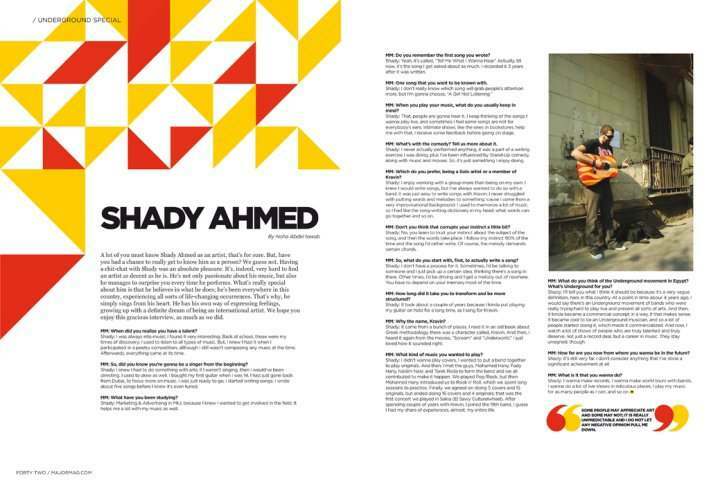 A lot of you must know Shady Ahmed as an artist, that’s for sure. But, have you had a chance to really get to know him as a person? We guess not. Having a chit-chat with Shady was an absolute pleasure. It’s, indeed, very hard to find an artist as decent as he is. He’s not only passionate about his music, but also he manages to surprise you every time he performs. What’s really special about him is that he believes in what he does; he’s been everywhere in this country, experiencing all sorts of life-changing occurrences. That’s why, he simply sings from his heart. He has his own way of expressing feelings, growing up with a definite dream of being an international artist. We hope you enjoy this gracious interview, as much as we did. To check out his tracks, go to myspace.com/ShadyAhmed. MM: When did you realize you have a talent? Shady: I was always into music; I found it very interesting. Back at school, those were my times of discovery; I used to listen to all types of music. But, I knew I had it when I participated in a poetry competition, although I still wasn’t composing any music at the time. Afterwards, everything came at its time. MM: So, did you know you’re gonna be a singer from the beginning? Shady: I knew I had to do something with arts; if I weren’t singing, then I would’ve been directing. I used to draw as well. I bought my first guitar when I was 14, I had just gone back from Dubai, to focus more on music. I was just ready to go, I started writing songs; I wrote about five songs before I knew it’s even tuned. MM: What have you been studying? 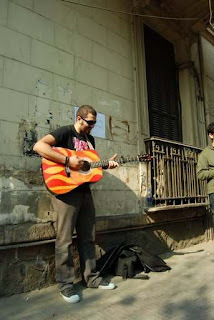 Shady: Marketing & Advertising in MIU, because I knew I wanted to get involved in the field. It helps me a lot with my music as well. MM: Do you remember the first song you wrote? Shady: Yeah, it’s called, “Tell Me What I Wanna Hear.” Actually, till now, it’s the song I get asked about so much. I recorded it 3 years after it was written. MM: Which do you prefer, being a Solo artist or a member of Kravin? Shady: I enjoy working with a group more than being on my own. I knew I would write songs, but I’ve always wanted to do so with a band. It was just easy to write songs with Kravin; I never struggled with putting words and melodies to something ‘cause I come from a very improvisational background. I used to memorize a lot of music, so I had like the song-writing dictionary in my head; what words can go together and so on. MM: Don’t you think that corrupts your instinct a little bit? Shady: No, you learn to trust your instinct about the subject of the song, and then the words take place. I follow my instinct 90% of the time and the song I’d rather write. Of course, the melody demands certain chords. MM: So, what do you start with, first, to actually write a song? Shady: I don’t have a process for it. Sometimes, I’d be talking to someone and I just pick up a certain idea, thinking there’s a song in there. Other times, I’d be driving and I get a melody out of nowhere. You have to depend on your memory most of the time. MM: How long did it take you to transform and be more structured? Shady: It took about a couple of years because I kinda put playing my guitar on hold for a long time, as I sang for Kravin. MM: Why the name, Kravin? Shady: It came from a bunch of places. I read it in an old book about Greek methodology, there was a character called, Kravin. And then, I heard it again from the movies, “Scream” and “Underworld.” I just loved how it sounded right. MM: What kind of music you wanted to play? Shady: I didn’t wanna play covers, I wanted to put a band together to play originals. And then, I met the guys, Mohamed Hany, Fady Hany, Nadim Nasr, and Tarek Reda to form the band and we all contributed to make it happen. We played Pop/Rock, but then Mohamed Hany introduced us to Rock n’ Roll, which we spent long sessions to practice. Finally, we agreed on doing 5 covers and 15 originals, but ended doing 16 covers and 4 originals; that was the first concert we played in Sakia (El Sawy Culturalwheel). After spending couple of years with Kravin, I joined the 19th band. I guess I had my share of experiences, almost, my entire life. MM: What do you think of the Underground movement in Egypt? What’s Underground for you? Shady: I’ll tell you what I think it should be because it’s a very vague definition, here in this country. At a point in time about 4 years ago, I would say there’s an Underground movement of bands who were really trying hard to play live and present all sorts of arts. And then, it kinda became a commercial concept in a way, if that makes sense. It became cool to be an Underground musician, and so a lot of people started doing it, which made it commercialized. And now, I watch a lot of shows of people who are truly talented and truly deserve, not just a record deal, but a career in music. They stay unsigned, though. MM: How far are you now from where you wanna be in the future? Shady: It’s still very far. I don’t consider anything that I’ve done a significant achievement at all. MM: What is it that you wanna do? Shady: I wanna make records, I wanna make world tours with bands, I wanna do a lot of live shows in ridiculous places, I play my music for as many people as I can, and so on. MM: One song that you want to be known with. MM: When you play your music, what do you usually keep in mind? Shady: That, people are gonna hear it. I keep thinking of the songs I wanna play live, and sometimes I feel some songs are not for everybody’s ears. Intimate shows, like the ones in bookstores, help me with that, I receive some feedback before going on stage. MM: What’s with the comedy? Tell us more about it. Shady: I never actually performed anything, it was a part of a writing exercise I was doing, plus I’ve been influenced by Stand-Up comedy, along with music and movies. So, it’s just something I enjoy doing.